1 big thing: Ex-Facebooker traces firm's "black people problem"
While nearly all Big Tech companies are lacking in diversity, Facebook has a "black people problem" that goes far beyond the fact that black employees make up just 4% of workers. 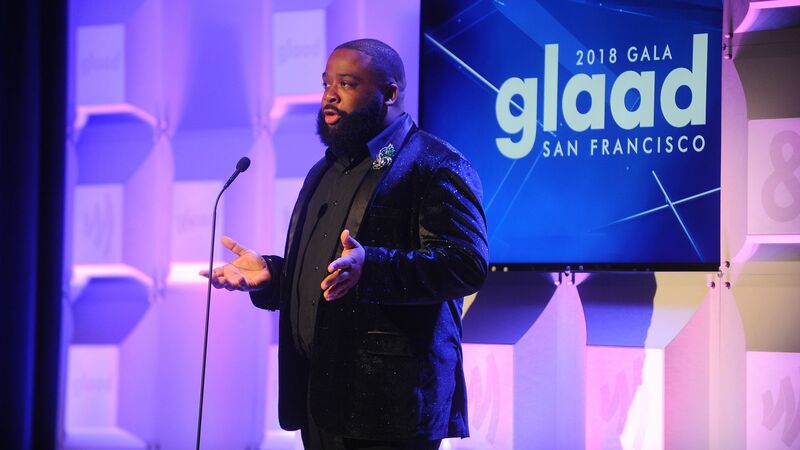 That's according to former Facebook employee Mark Luckie, whose departing memo to Facebook employees, which went viral on Tuesday, starts with: "Facebook has a black people problem." Why it matters: For Facebook, this is yet another issue where the company has to defend itself. More broadly, the whole industry is beginning to be called to account for a long record of failing to deliver on promises of inclusion. Facebook's lack of diversity: "In some buildings, there are more 'Black Lives Matter' posters than there are actual black people." The racism he encountered, including seeing fellow employees grab their wallets multiple times a day as he passed. Steps he thinks the company should take, ranging from creating data-driven goals to a system for workers to report micro-aggressions. Luckie told Axios that the problem isn't just that there are so few black faces in the company's leadership or its ranks. It's that Facebook doesn't seem invested in creating a more welcoming environment. "The company doesn’t try," Luckie said in an interview Tuesday night. "It could be doing much more than it's doing." He pointed to companies like Twitter and Slack as examples of enterprises that are investing time and money in changing their cultures. "They are allocating resources," he said. "They are going beyond lip service." Luckie lamented that the company's official response was limited to communications from two of the few black executives at the company. "I’d like to see greater acknowledgement from Mark [Zuckerberg], Sheryl [Sandberg] or some of the VPs," he said. "They do public posts for all manner of issues." What's next: A delegation from Facebook, including Sandberg, is meeting Thursday with Color of Change, which has been pushing for greater diversity in tech. Luckie called that an opportunity to continue the conversation he had started. As for Luckie, he's moved to Atlanta. For the moment he is working on finishing up a scripted sci-fi podcast he had been writing in his spare time. After that, he's not sure what his next job will be. "I don't anticipate going back into tech," he said. "I’d love to continue the fight, or lead the charge, but I don’t have it in me. I’ve just been failed so many times." While Luckie's memo was being shared online, a Facebook executive was testifying before the British Parliament to deny reports that an employee had warned the company about Russian operations on the platform as early as 2014. Why it matters: Facebook has maintained it wasn't aware of the Russian data gathering efforts until 2016. Details: The Brits, as has become standard practice, left an empty chair for CEO Mark Zuckerberg, who refused to attend the hearing. The executive who did appear got peppered with questions based on documents British authorities seized from an executive whose company is suing Facebook. The member of Parliament who obtained the documents says he hopes to share them publicly. "I can't give you an exact date, but I would hope we would be in a position to publish them very soon," he said Tuesday, according to CNN. "Certainly within the next week or so, that would be my hope." Meanwhile, in Washington, the Federal Trade Commission was holding a hearing with Sen. Richard Blumenthal (D-Conn.), who blasted the agency for not doing more to rein in Facebook. The bottom line: Even as new headaches emerge for Facebook, the old ones aren't going away. The Justice Department announced Tuesday that it has brought criminal charges against 8 people on 13 indictments related to a digital ad fraud scheme dubbed "3ve" worth tens of millions of dollars. The scheme, which included 3 separate operations, was uncovered by Google and fraud detection firm White Ops, Axios' Sara Fischer reports. Why it matters: The operation was one of the largest and most sophisticated schemes ever to be uncovered involving digital ad fraud, in which advertisers are charged for bogus ad views. The discovery required unprecedented collaboration between law enforcement and dozens of different private sector groups, many of whom are competitors. The big picture: The digital ad industry is extremely vulnerable to such kinds of fraud because there's a lot of money at stake ($273 billion globally, per eMarketer), and there's very little regulation or oversight of transactions. To make matters harder, online criminals can operate well beyond their physical jurisdictions, which means it usually takes international law-enforcement bodies to work together to identify and dismantle such operations. Be smart: Per BuzzFeed's Craig Silverman, who broke the story: "With today’s charges and the takedown of 3ve’s systems, the Department of Justice is sending a message that it now recognizes ad fraud for what it is: a global criminal industry that’s stealing billions with impunity and little fear of prosecution." Read more of Sara's story here. Sara has learned that Imran Khan, former chief strategy officer at Snap, has raised $17.5 million for his new e-commerce startup, according to a source familiar with the deal. Why it matters: Khan is launching a multi-brand retailer aimed at millennials, with an eye toward someday taking on Amazon. Lightspeed Venture Partners was the lead investor, with Khan's friends and family also participating. Khan's wife Cate, who recently stepped down as head of retail for Amazon-owned Quidsi, will join the startup as a co-founder. Go deeper: Sara has more here. Amazon's AWS re:Invent conference continues in Las Vegas. The Early Futures conference wraps up today in San Jose, California. I'll be interviewing Khan Academy founder Sal Khan on stage later today. Tesla global security chief is out after 11 months. Waymo has hired National Safety Council CEO Deborah Hersman as chief safety officer and retail executive Amee Chande as chief commercial officer, both new positions reporting to CEO John Krafcik. The Spanish word for plants is plantas. The Spanish word for pants is pantalones. 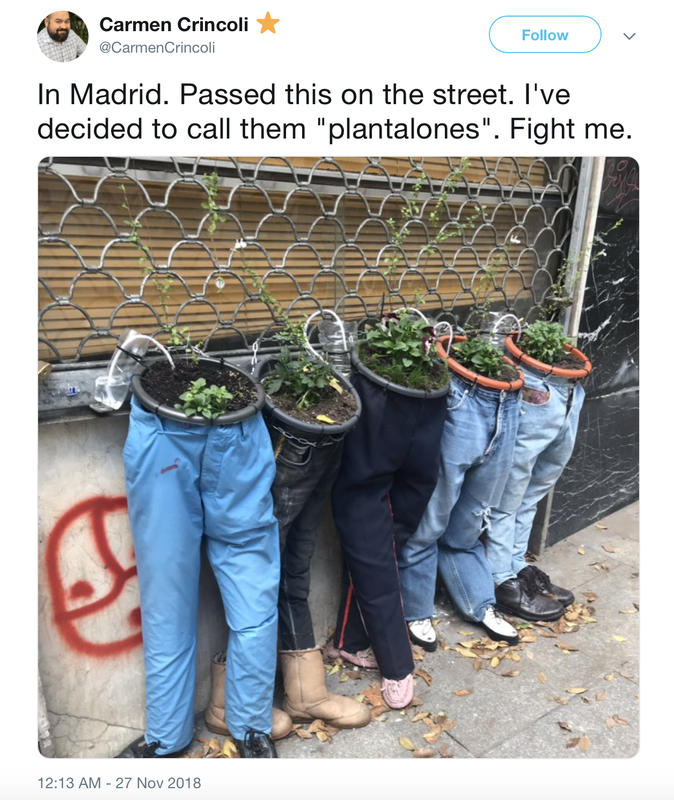 Now meet plantalones.